Well built, easy to operate, performs very well. Control could be better labelled, slightly plain looking. 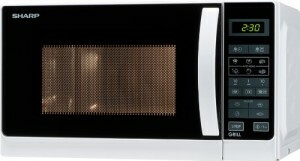 If you're looking to purchase a compact grill microwave, then the R642WW from Sharp may well tick that box. Featuring a modest 20 litre capacity and 800w power output in microwave mode, it's finished in a rather plain yet attractive white exterior. The built in grill features a 1000w output, and performed well during the test. The controls, situated to the right hand side of the left hinged door, feature symbols rather than text, and as such it can be a bit tricky initially to work out which button performs which task. Once you've got the hang of it it becomes pretty easy though. The overall look and feel of this microwave is function over style - it may not be the most desirable looking microwave, but in terms of performance we could find little to fault. 8 different cooking and defrost settings are included, together with 11 different power levels - so no matter what you're cooking or defrosting, then there should be a selection for you. The display is digital, with the green LED display being easy to read even in a brightly lit kitchen. So what did we think overall? Overall the Sharp R642WW works well, and based upon past experiences should prove to be reliable. It's easy to use, and cooks well. It may not look as flash as other grill microwaves, but in terms of performance we were impressed. This microwave is also available in a black colour scheme. – What are the dimensions of the oven interior? – What is the diametre of the turntable? 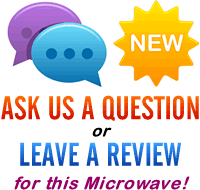 – Is the oven interior made of stainless steel?